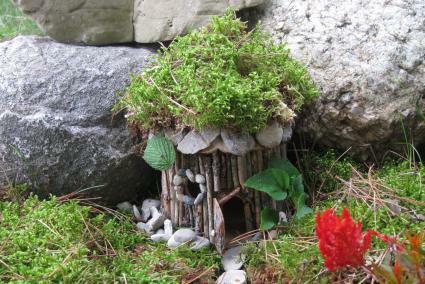 With their miniature scale and natural style, fairy houses add a touch of whimsy to any garden. 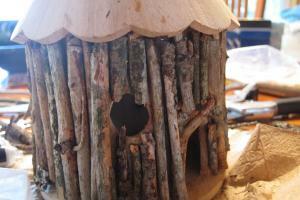 You can create your own tiny fairy home with a few simple supplies and a couple of hours of your time. This diminutive dwelling will give your garden a magical ambience, as well as an adorable focal point. Fairies build their homes with the materials they find around them, so most of your fairy house supplies will be easy to source from your own backyard. The base of the house comes from a purchased bird house, which means you can concentrate on decorating the dwelling instead of worrying about its structural integrity. 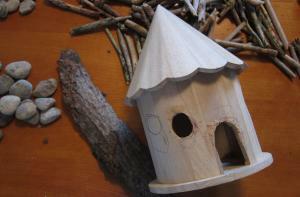 Place your bird house on your work surface and think about how you'd like to arrange the door and window. You can use the existing hole or choose to cover it and start with your own design. Sketch your ideas directly on the wood, since you'll be covering the entire surface. When you've decided on the door and window placement, use a drill and the appropriate size of bit to cut the holes in the bird house. You can refine the holes using a hacksaw blade. Don't worry if your edges are a bit rough; you can fill in any splintered areas with wood filler. Measure the height of the bird house walls. You'll need to cut lots of sticks to this length. 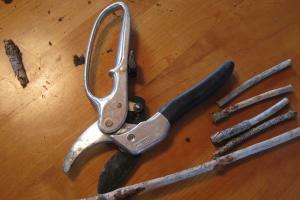 You can use pruning shears to make the job easier. Simply measure one stick and then use that as a guide to cut the rest. 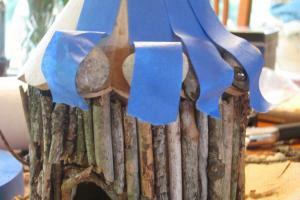 You will need enough sticks to completely cover the walls of the bird house. Leave a few sticks longer so you can trim them to fit areas around the door and window. Mix up a little of the epoxy on a paper plate and spread an even layer up the wall of the bird house. Start with a section that's about two inches wide. Wait a minute or so for the epoxy to become a little tacky and then begin pressing sticks into the glue. Continue until you've covered the bird house walls with sticks. You'll need to mix more epoxy from time to time. If you want to change the window size and placement, simply cover any existing holes with sticks. Working with a few inches at a time, apply epoxy to the edge of the roof. While you're waiting for the epoxy to become tacky, stick painter's tape to some of the one-inch rocks. Press the rocks into the epoxy, and stick the tape to the rest of the roof to support the rocks' weight. Continue all the way around the roof. Let the house sit while the epoxy dries, usually around ten minutes. 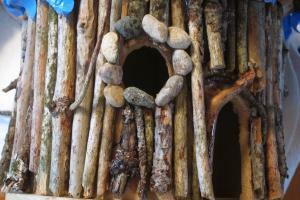 Trace the shape of the doorway onto a piece of bark using a pen or pencil. Use the kitchen shears to cut the bark into a door shape. 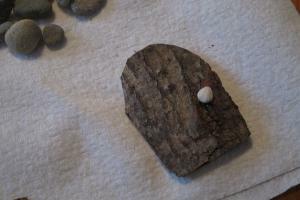 Dab a small amount of epoxy on a tiny stone and affix it to the bark door as a knob. Allow this to dry for ten minutes. When the door and the house are dry, use epoxy to attach the door to the house in an open position. You may need to support the door with painter's tape as it dries. Add decorative stones around the edge of the window using epoxy. You'll want to use the smallest rocks you can find to give this a delicate, miniature look. Allow the stones to dry in place. Cut some moss to apply to the roof of the house. 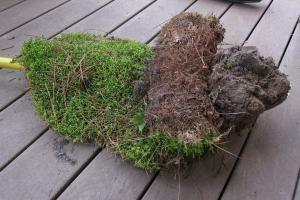 You can roll the moss in on itself like a carpet to make it easier to transport. Trim the moss to fit the roof of the house using kitchen shears. Find a good spot for your fairy house. Remove the grass in this area and place the house in your desired location. Apply moss all around the house and on top of the roof. Create a path to the front door using flat stones. Plant a few flowers nearby. 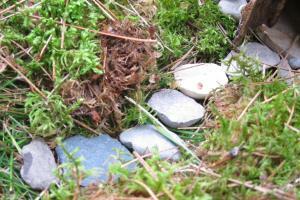 Give the entire house and the moss a good soaking to ensure the moss stays moist. You'll need to water the moss from time to time to keep it alive. Since you'll be making your fairy house from materials around your home, it will be completely unique and will fit perfectly in your landscape. This decorative summer craft will become a magical focal point in your garden.